If you're familiar with our YouTube Channel, you know we began our creative journey by making arts & crafts using every day items around the house. This week we're going to back to those roots by making beautiful newspaper art. 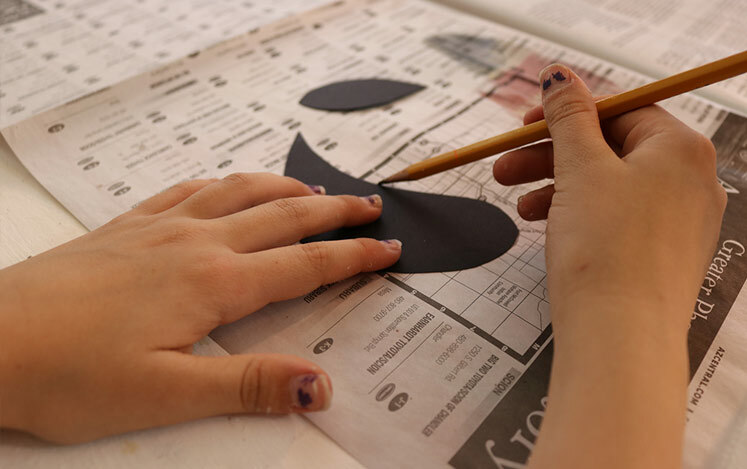 The best thing about this art project is that kids and adults alike will both enjoy the process. We know...our mom certainly did! 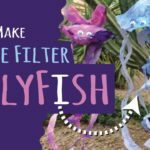 Kids Crafts by Three Sisters will show you how to recycle newspapers & party streamers into beautiful wall art. The overlay technique we demonstrate in the video and below are ideal for a canvas in need of a refresh. 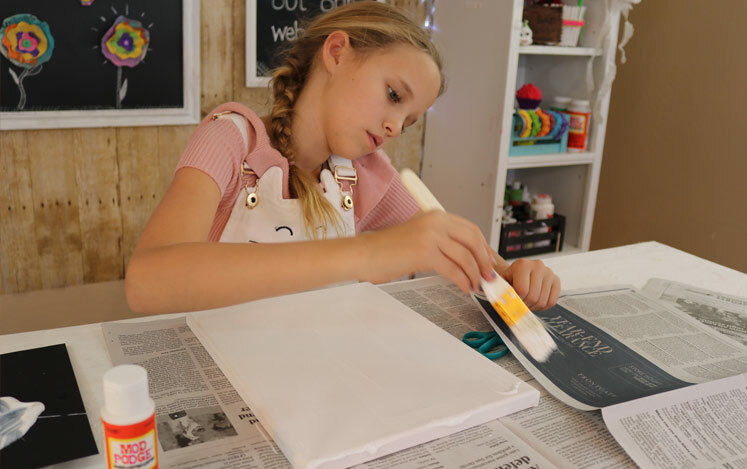 So before running to the store for this newspaper art project, have a look around the house for a canvas you could recycle. Furthermore, feel free to swap out the accent elements we use, such as buttons, with rhinestones, glass beads or even bottle caps. Although we opt for acrylic paints in this tutorial, you can substitute acrylic for watercolor paints. 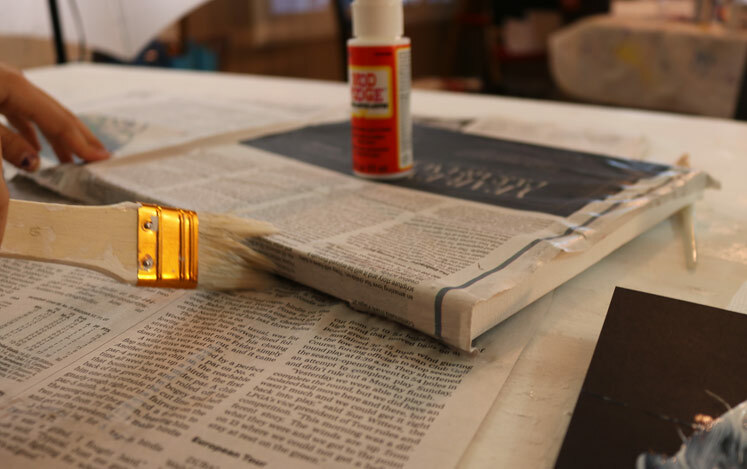 In our opinion, acrylic paints thinned out with a little bit of water appear more saturated (brighter) on newspaper. And we love that. But, it's really personal preference. Now, if you're artistic, draw your own bird. 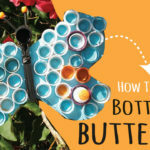 If you need a little help or want to use this idea with kids, download our FREE BIRD & WING TEMPLATE BELOW! 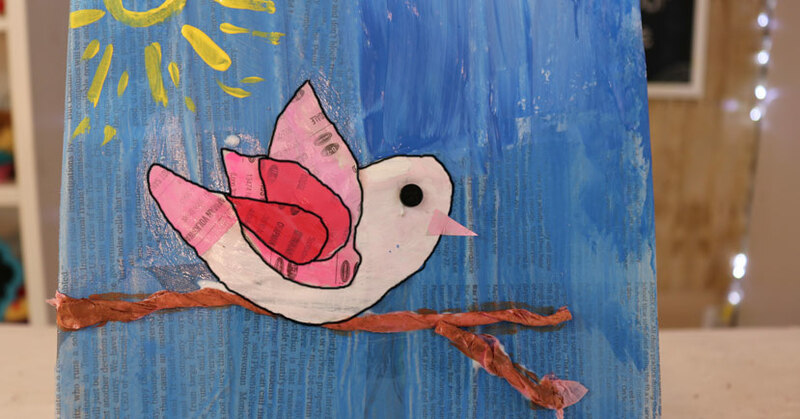 This is the exact bird template we used on our Bird Newspaper Art. Remember this is art, embrace the creative process and let your mind wander. There are no rules! • 1 canvas - We used an 8 x 10 canvas, but it can be smaller too. 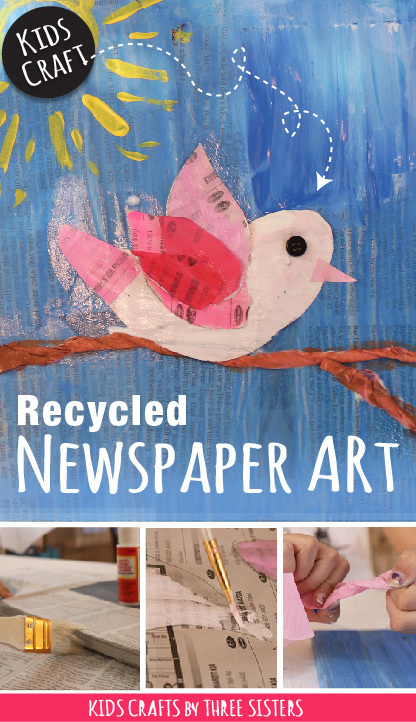 HOW TO MAKE BIRD NEWSPAPER ART! STEP 1: Start by covering the canvas with newspaper. We did this by coating the entire canvas with Mod Podge then laying an entire sheet of newspaper directly onto the canvas. Slowly smooth out the newspaper from top to bottom trying to remove as many air bubbles as you can. However; don't obsess over this step a few imperfections here and there give the newspaper art a rustic or vintage look. 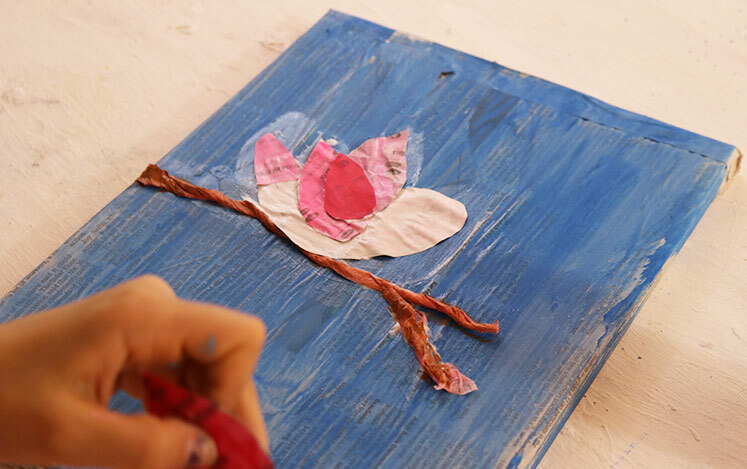 NOTE: You can also tear strips of newspaper and layer them onto the canvas. There's no right or wrong technique, it's entirely your preference on how you'd like the background to appear. 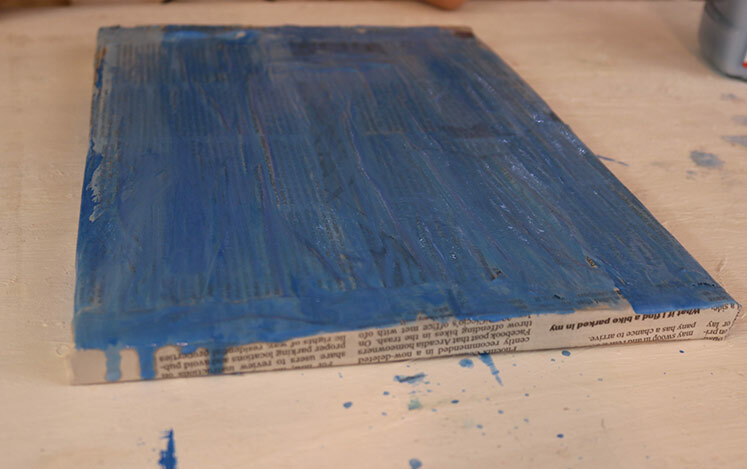 STEP 2: When you get to the edges, brush Mod Podge onto the edge and fold the newspaper over. Similar to how you would approach a christmas gift. Repeat this step around each edge. 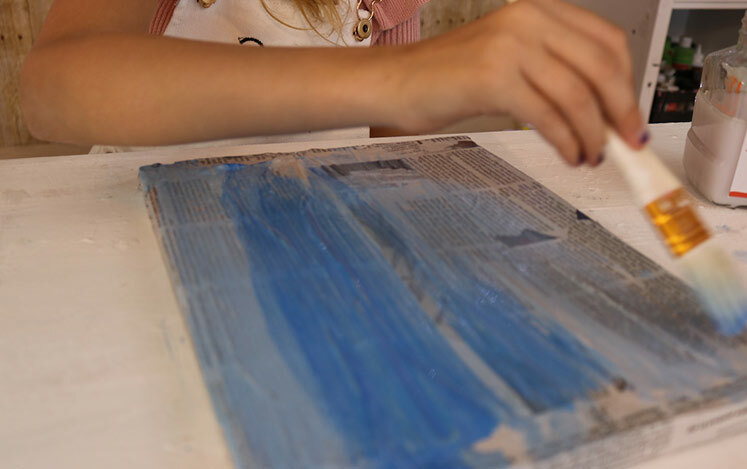 STEP 3: To create the background for the bird newspaper art, start layering different shades of blue onto the newspaper. Start with the lighter blue and move to the darker. If the blues appear to dark just add a little white until you get the shade you're looking for. 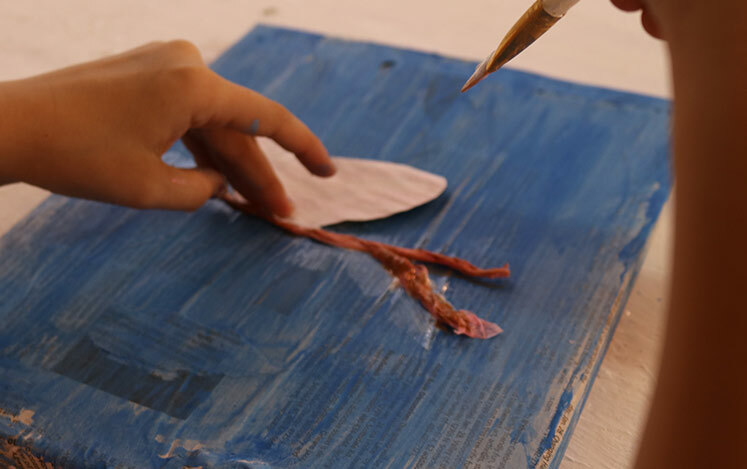 We recommend dipping your paint brush in the water a little and then picking up some blue paint. 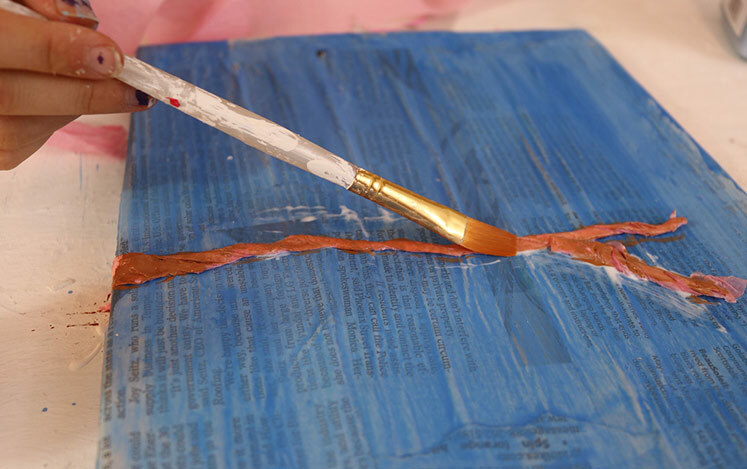 The water will not only thin out the paint, but will also make it easier to blend the colors. STEP 4: While the newspaper art background is drying, let's move onto to making the bird body and wings. You can always draw your own bird or get a little help by using our free bird template. Simply trace the bird body and 4 bird wings onto a sheet of newspaper. NOW THE FUN PART, PAINTING YOUR BIRD! 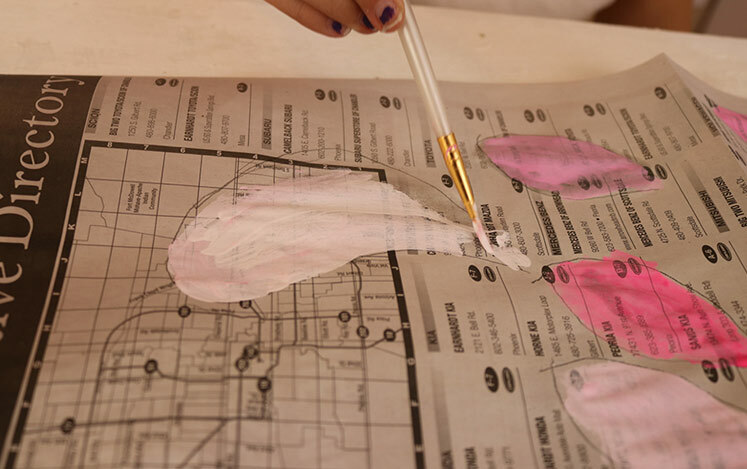 STEP 5: Paint the body of the bird white and the wings differing shades of pink. Of course, feel free to adjust the color based on your preference and color background. NOTE: We really enjoyed the way the text came through the paint. It added more dimension and interest to the birds wings. STEP 6: Once the bird elements are dry, cut the body and wings from the newspaper. 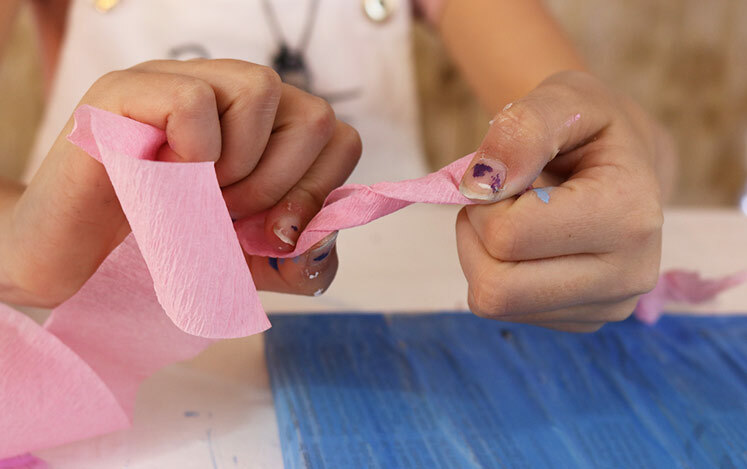 STEP 7: To make the tree branch for our bird, we'll be recycling party streamers! All you have to do is twist the streamers to make a the branches. 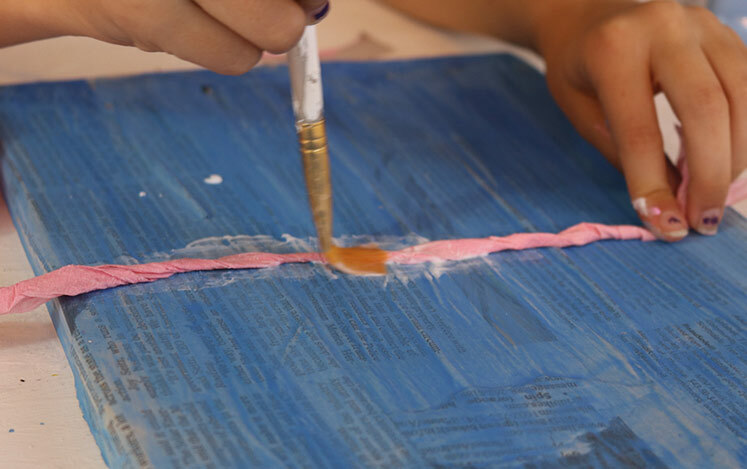 STEP 8: Mod Podge the tree branch (streamers) to the canvas. You'll want to make at least one long horizontal branch and then a smaller twig coming of the top or bottom. We added another layer of Mod Podge directly over the streamers to ensure the tree branch didn't move. STEP 9: Depending on the color of party streamer you used, paint it a shade of brown to resemble a tree branch. 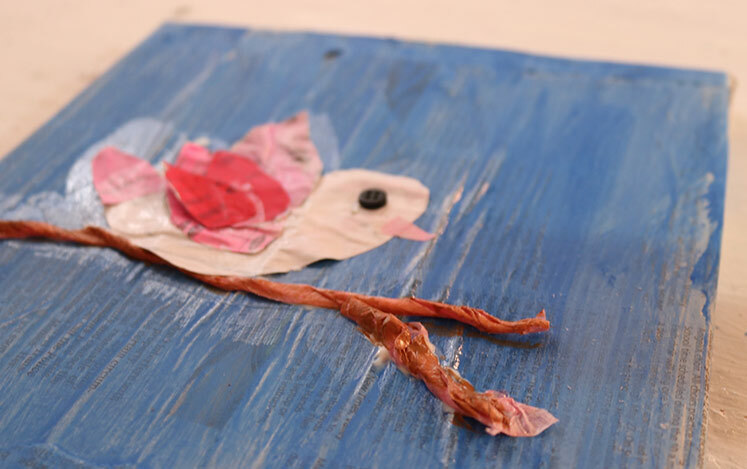 STEP 10: Mod Podge or glue the bird body & wings to the newspaper art. NOTE: You can position the bird actually sitting on the branch or above it a little bit leaving you room to hand draw legs and feet on the bird. As we layered the wings on our bird, we trimmed the top wings to be slightly smaller in size to show off the color range. STEP 11: Add a small button for the eye and make a small triangle for the bird beak. NOTE: Decorate the rest of the newspaper art as much or as little as you'd like. Outline the shape of the bird & wings with a black sharpie to highlight the elements. 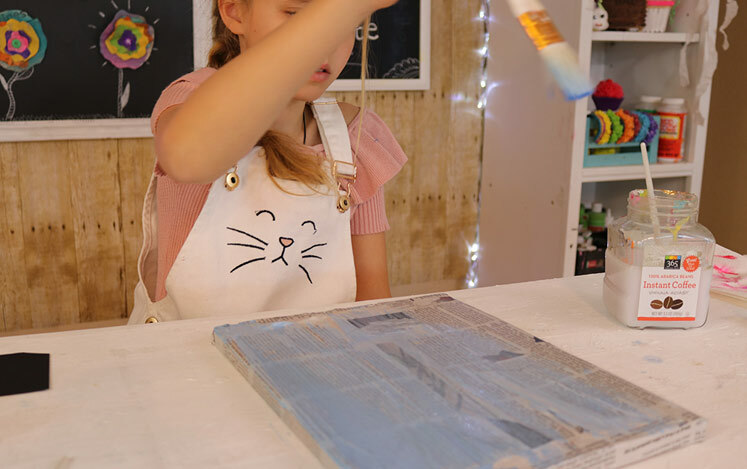 You can also stamp the edges with black ink and even add flowers to the bottom of the canvas like we did in our video tutorial. Your pictures are adorable! 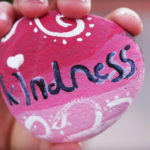 Thi s will be my nect project with my granddaughter Maddi. Thankyou! Hi Carolyn! Thank you so much. We’ll say hello to Maddi in our next video!